Stephanie Smith demonstrates the difference between religion and relationship. As Rose surrenders her hurt, her pain, her disappointments to God, so she will emerge a new creation. Prayer is of vital importance. “Prayer was like talking to a close friend.” Sometimes life is so hard that all you can do is pray and lean heavily on God. Having fellowship with other Christians will help sustain your walk with God. Stephanie Smith shows how church doesn’t have to be boring. It can be great fun and it should be great fun. Miss May is a larger than life pastor with a heart for God and a heart for people who also has the joy of the Lord by the bucketful. After September has a wonderful orphanage which is echoing the commandment to take care of the widows and orphans. The children are all delightful. Stephanie Smith focuses in on five year old David who just tugs at the reader’s heart strings. There is the theme of loss. Rose lost her marriage. Patrick lost his wife and son. Both need a healing and restoration that only God can give. Rose had plans for her life. All her life she had followed other people’s plans for her life. Now she must take a risk and trust the unseen plans of a faithful God. The novel has a wonderful romance bubbling away. The reader follows its course, meandering through the novel with its twists and turns. The setting – sun, sea, sand, warmth – is perfectly drawn and a wonderful contrast to this readers cold, grey, dark English weather. I could ‘feel’ the warmth and ‘see’ the scene that Stephanie Smith painted so well. 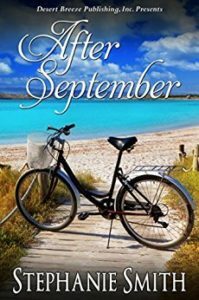 After September was a perfectly charming read and I loved every minute of it. I greedily devoured its pages and cannot wait to read more by Stephanie Smith. Pure escapism with God at the heart. Wonderful read. Thank you so much for your review and being a part of my tour with Celebrate Lit! I’m happy you enjoyed Rose’s story! Thank you for participating in the tour.